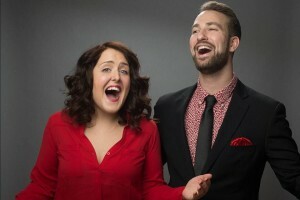 I recently had the pleasure to sit down with Evan Kaufman and Rebecca Vigil whose popular musical improv show “Your Love, Our Musical” has received wide success throughout New York City, including a write-up in the New York Times. Their show starts off with both Kaufman and Vigil interviewing a random couple from the audience and then doing a fully improvised musical based on their love life. The result is comedy gold. Christian Roberts: How long have you guys been performing in New York City? What prompted you to join forces and create “YLOM”? Rebecca Vigil: I’ve been performing in New York for a little over six years, doing musical comedy in all sorts of different capacities. Evan Kaufman: And I’ve been performing here for around two and a half years. I moved from Boston in 2013, where I was performing at Improv Asylum. Vigil: Weirdly enough, I traveled to Boston to see a dear friend in a MainStage show at IA. It just so happened that Evan was in the show! I was blown away by his talent and hoped one day there would be an opportunity to perform with him. Vigil: I showed up to rehearsal and there he was! I immediately pitched him the idea to do the show and we have been going strong ever since. We’ve now been doing the show for a little over a year and the response has been tremendous. We’ve sold out The Peoples Improv Theater on a monthly basis, had a two page review in The Village Voice, a mention in The New York Times, and we where just accepted to one of the biggest theatre festivals in the country, The New York International Fringe Festival! Kaufman: Wow! When you lay it all out like that, it is pretty cool. I’m lucky you were in the audience that night in Boston! Roberts: What distinguishes your show from all of the other comedy shows in NYC? Vigil: Our show is a communal experience. In the first half we really get to know the couple we chose from the crowd. The audience becomes invested in their story. The musical ends up feeling like a community celebration of these two people who have shared their lives with us. Kaufman: It’s a very sweet and sincere show, which is a little different from your normal, hard-edged New York City comedy show performed for an audience of rats. It has to be sweet, in some ways, because it’s about love. I mean, it still gets weird. We still sing songs about people hunting each other for sport. Vigil: In our show, everyone is in on the joke. Each show is different so we end up having inside jokes with each audience… like that time we pretended to hunt someone for sport. Roberts: What are your plans down the road for YLOM? Kaufman: We’re currently raising money for a run at the 2015 NYC International Fringe Festival. We’re hoping that the Fringe helps us reach a wider audience. We have an incredible fanbase we’ve developed at The PIT. Most of those folks are improvisers. We’re hoping to dip our toe into the off-off-broadway theater world, get a weekly run, tour the show. Roberts: Have any opportunities come as a result of your show? Vigil: This is gonna sound sappy (fingers crossed) but I love the opportunity to meet couples and to show them they’re love story is interesting. People are always shocked that the audience cares about how they met, fell in love, etc. This show really celebrates love between the couple and “Love” in general. Kaufman: That was the right amount of sappy. Opportunity and business-wise we’ve started breaking into the bridal shower market which has been a great opportunity to drink mimosas and talk with aunts. In all seriousness those shows are amazing because everyone is in an incredible mood. Love is in the air. Even the grooms (who are brought to those events in chains) seem to have a good time. Vigil: Oh, also, seeing our faces in The New York Times resulted in the opportunity to crap our pants. Kaufman: Totes. And the opportunity to get new pants. Roberts:What are some words of advice you can give to people hoping to have a career in comedy? Vigil: Never let your self-doubt stop you. Everyone has self-doubt. Battling that voice that convinces you not to write that sketch or do that open mic is a major part of creating art. Fight that battle every day. And revel in the lessons that you learn when you are terrible. That is the only way you can get better. Kaufman: Do things. Don’t talk about them – do them. Start your show, podcast, web series, etc. Do it. It’s the dumbest easiest advice. I still don’t follow it enough. DO THINGS. Don’t worry about what will happen. Nothing can happen until you do something. I shouldn’t even be talking to you now. I should be doing things. Vigil: Also, work with people you find funny. Collaborating this year with Evan has been some of the most fulfilling work I have done. If you find the right person/people they will fill in the gaps. It never feels like work when I am with Evan. Evan: That was so sweet and sincere I crapped my pants.